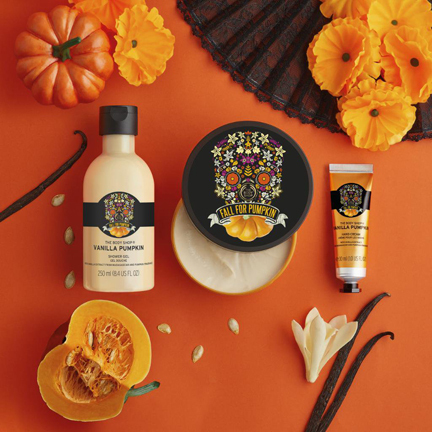 Get into the spirit of the autumn season by slathering on the indulgently fragrant Vanilla Pumpkin range from The Body Shop. This special edition line is composed of the creamy and caring trio of shower gel, body butter, and hand cream. Each is infused with sweet, handpicked vanilla from Madagascar, the addictive autumnal aroma of roasted pumpkin seeds, and the warm notes of tonka bean, hazelnut, and maple syrup. Lather up and smell sweet all season with the thick and creamy soap-free Vanilla Pumpkin Shower Gel. After bath, moisturize with the indulgently rich, nourishing, and fabulously fragrant Vanilla Pumpkin Body Butter. Lastly, protect those hands during cold months with the super lightweight and 100 percent vegan Vanilla Pumpkin Hand Cream. This autumn-inspired line is available at all The Body Shop stores nationwide.